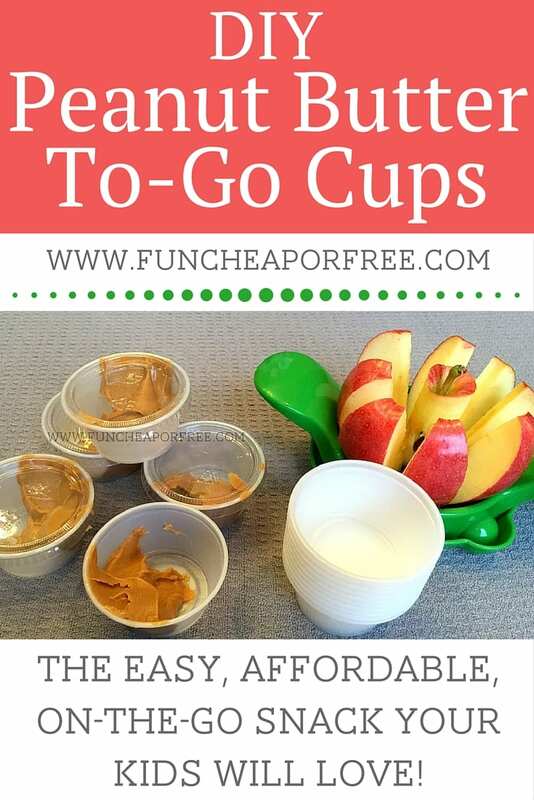 DIY Peanut Butter To-Go Cups - Easy On-the-Go Snack! 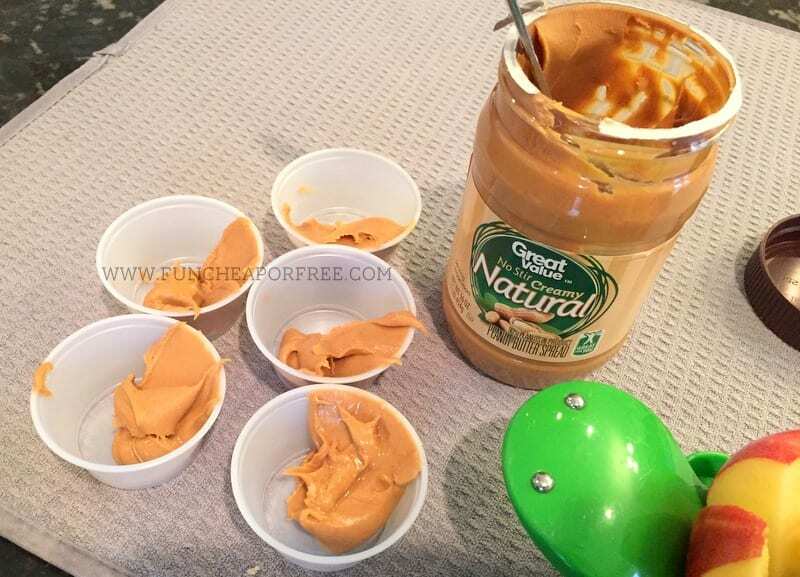 Portion your peanut butter in your fancy schmancy condiment cups. I love them because they are the perfect size, and disposable! I use them for storing crafts, leftovers, many #PageDinnerOnTheRun meals, traveling, you name it. I got them from Walmart in the paper plate aisle, but you can also get them from Amazon. Portioning out the peanut butter isn't scientific for me, I just grab a good amount, and spread it in the cup. If you want to be more exact about portion size, you could always use one of these measured scoops. I use them for cookies, you can use them for healthy stuff if you want! I fought it for YEARS, then finally caved and got my apple slicer. I now am obsessed and don't know how I lived without it for so long. It really makes it so much easier (and we eat a LOT of apples at our house so it's totally worth it). It cores them out, and slices them into perfect, even chunks every. single. time. Magic, I tell you! 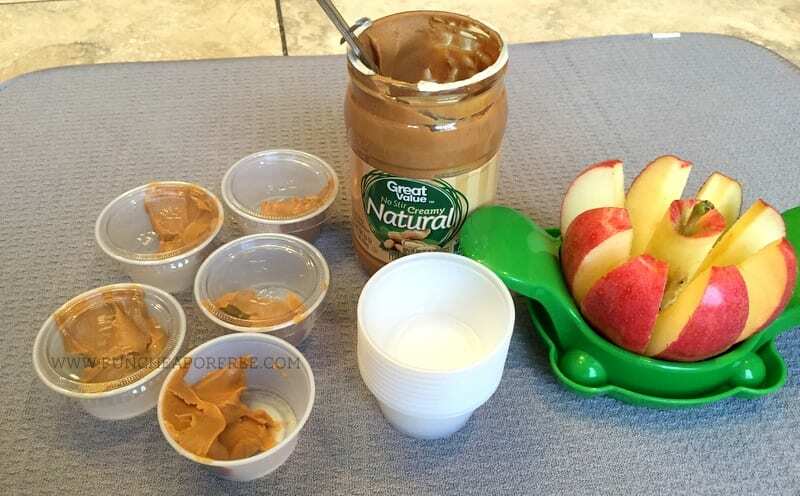 I like to slice up several apples and keep them in baggies in the fridge, so my kids can grab their own apple and peanut butter for a snack. How do you keep the apples from turning brown? Easy. 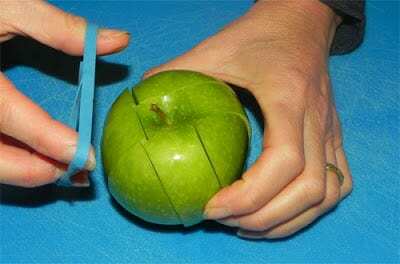 Slice with your slicer or knife, and use a rubber band to old it together (as shown in THIS POST full of clever tips and tricks). Another secret weapon of mine is Fruit Fresh. You can sprinkle it on ANYTHING and it will keep it from going brown, without altering the taste much. Talk about magic! Lastly, you could sprinkle a bit of lemon juice on your apples if you don't mind the lemon taste. The acid from the fruit will keep the apples from turning brown. 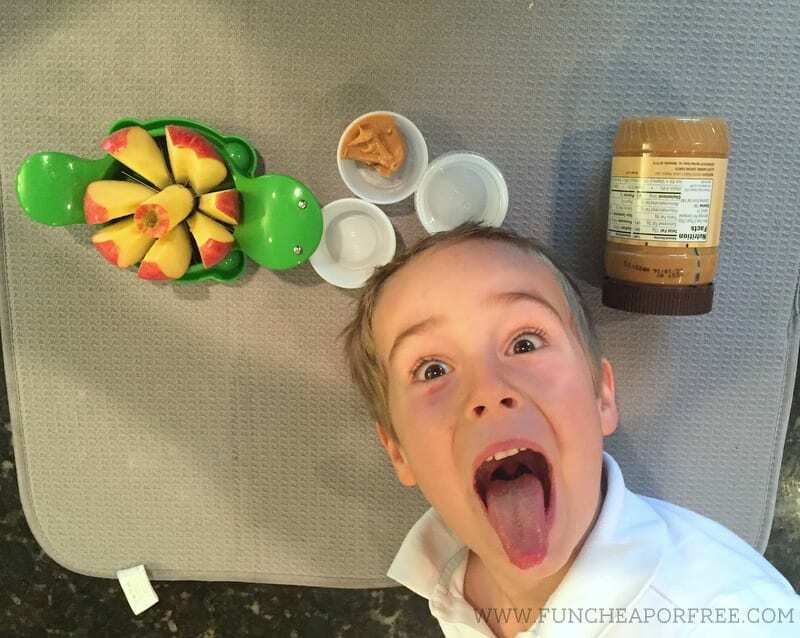 DIY Peanut Butter To-Go Cups for the W-I-N! They are perfect to throw in a lunchbox with carrots, apples, celery or graham crackers, etc. I keep a whole stash of them in the pantry, and always try to have at least 1-2 sliced apples in the fridge. I love that my kids can grab their own healthy snack when they get home from school, without needing my help or making a huge mess. They are also AMAZING for travel and running out the door! Do you have a clever on-the-go snack idea? Please share in the comments below, I love new ideas! 11 Best Beauty Hacks you NEED in your Life! You can also put your apples in Sprite or 7-Up and it will keep them from browning and will not affect the taste. Oooh, great idea! Another idea using the same to-go cups could be hummus. Stick hummus in one of them, grab some carrots or pita chips for another snack. Why didn’t I think of this? I’ll definitely be buying some of these cups on my Walmart run here in a little bit! Keep the ideas coming!